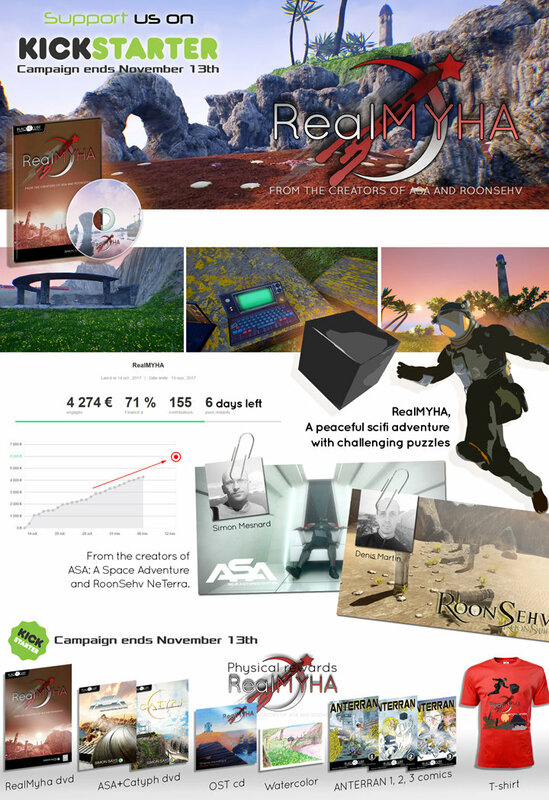 Update: The project title is not RealMyha anymore (it was our working title for the Kickstarter). 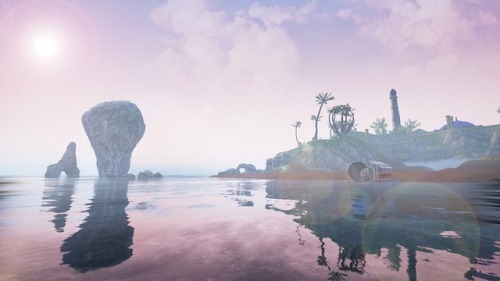 Now we talk of Myha: Return to the Lost Island. It is a total remake/reboot of the original Myha Game! Let me know if you have questions about the game or our Kickstarter, I’ll stay around here to reply, or I’ll add them to our list of questions for the future FAQ on KS. 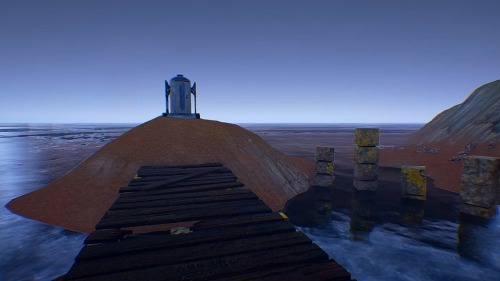 RealMyha is the complete remake of Myha, a game that I created in 10 days during the Myst Game Jam on itch.io in january 2016 (link below). 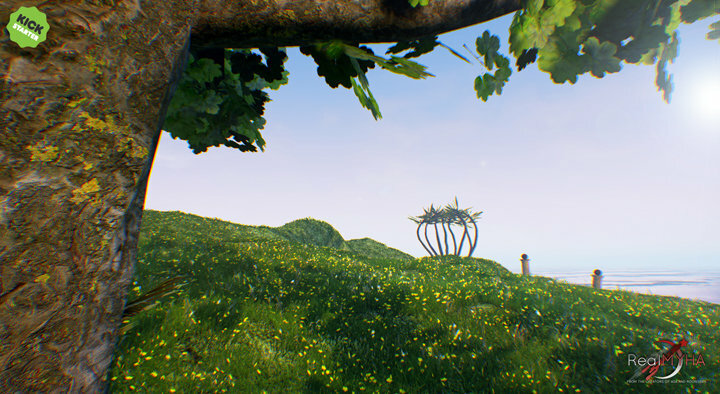 The remake will be a first person adventure game in full3d (Unreal Engine) from the creators of ASA and RoonSehv (links below). So actually what does it mean? That we’re trying to use the best skills from the two of us, in order to work together on this new project. I must say that it’s very exciting for me, and Denis is very, very motivated. We shared a lot of interesting ideas. Concretely we’ll try to mix the gameplay of RoonSehv, with the puzzles and worlds of The Black Cube series (ASA, Catyph…), with improved and new puzzles, a new soundtrack (and more) in order to create this new game. It will be longer and more complete. 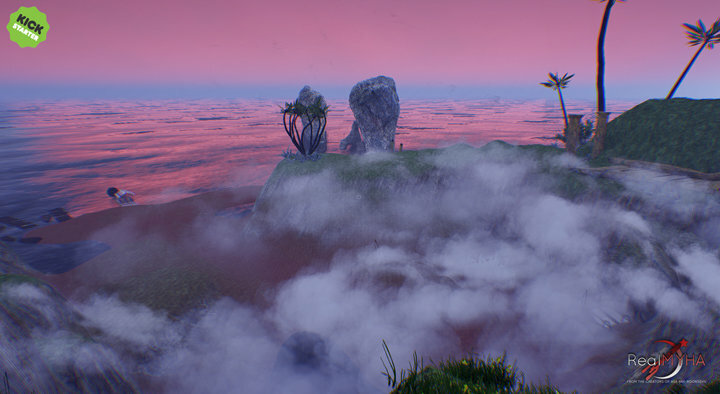 The main storyline of RealMyha will be the same than in Myha (the original game), but we will rework it a little bit, and additionnally we plan to add a secondary quest. The cutscenes (opening and ending) will also be entirely remade for the occasion. 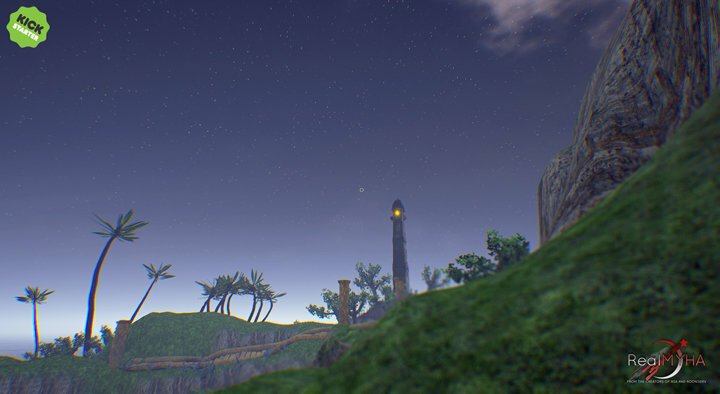 Honestly, even with the same background than the original game, you will see a real difference in RealMyha! 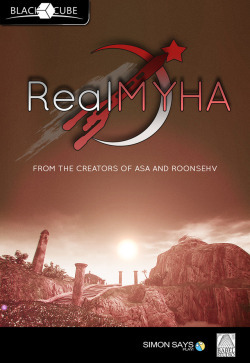 - If you liked the first Black Cube game ASA, then there is no reason that you won’t like RealMyha! 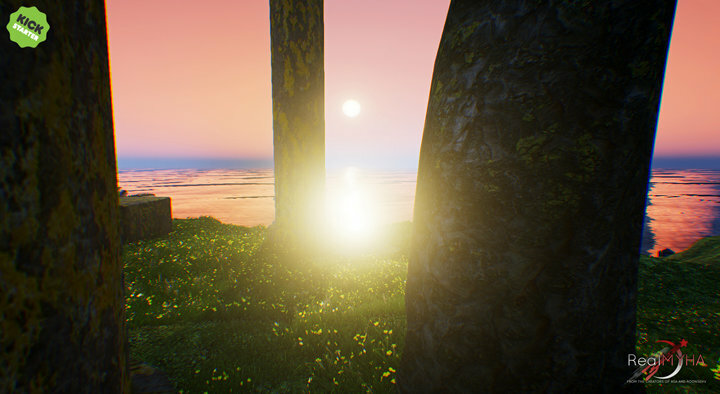 - If you liked RoonSehv, you know that we have the skills to use Unreal Engine. Good news: Denis has learned a lot since his first game! - The creator of the Black Cube series, and the creator of RoonSehv, are both already known individually for their past projects. Now they team up to create a new game: isn’t it exciting? We’re really counting on you to make it a reality! Looks nice, what would you say are the sys requirements for it? However I can try to give you a beginning of answer: we want the game to run even on computers that are not too recent. Denis would tell you better than me, but if you are able to run the prototypal demo called “Myha Realtime” (which can be seen as a kind of short prequel to RealMyha), then the final game should play too - it could just ask a bit more power. As soon as possible I will update this thread with more accurate system requirements. That will be great if you can help! I contact you with PM regarding the Icehouse forums. thank you to support our work, and soon a new game for you =) i hope ! Yesterday has been a great day! We hope that adventure fans will be as excited as we are! Didn’t know about this until I read this post. I backed it. I do worry that because the game is so cheap, that the goals will be harder to reach. Hi darthmaul! I saw your pledge yesterday, thanks again. Regarding our current goal, I think that the upcoming “add-ons” could help us to reach it (anyway there is hope). These add-ons will be announced soon, probably next week. Also, the stretch goals will be revealed during this weekend if I am not mistaken. They will probably be hard to reach however, but they will be there mainly to show you what we could add with more help. The stretch goals, even if they were not reached during the campaign, could eventually still be created during our free time later: we won’t close the door to them, but we cannot promise anything. As a result they could require much more time and efforts to be added, and so they could only be released, at best, several months or years after the release of the game. For the moment, the most important is to reach the main goal, and make the game possible to finish with the best quality! Thank you everyone, again and again. You are now 120 backers and we find it impressive! It is almost half the time before the end of our campaign. With your help we have reached 43% of our goal, so we can still do it! Nothing is lost. This is a reminder because it is the last 4 days to support us if you want. We are now funded at 78%, so it would be a shame for our 164 backers if we failed! We’ve reached the goal with success. I hope if will hold! Anyway it’s incredible. Thanks to everyone on AG who supported it the game!! Congrats guys, really happy you’ve made it!